New season, new score, new do. It is done. My long nightmare of extreme tailoring is finally at an end. I’ll spare you the details, but this post was very nearly an allegory about a Faustian bargain I made on the promise of my ideal pair of pants. I didn’t quite sell my soul, but it’s all true, the road to Hell is paved with your best intentions, the Devil finds work for idle hands, and when you get to the details he’ll meet you there and make you sweat. I still think it might make a fun story, but when I told it to Mr Edge he said it was a mad idea, it’s just trousers and it was my turn to wash the dishes. On with the show. This is far and away the most complicated sewing project I can remember, mainly because I was without a map and I had to figure it all out for myself. I thought I was close to the finish last time I posted, but no, there was still some way to go. I couldn’t solve the “break” problem I mentioned in the last post. I tried for a longer length, but the form kept collapsing further up the leg and I ended up back at the same awkward point. 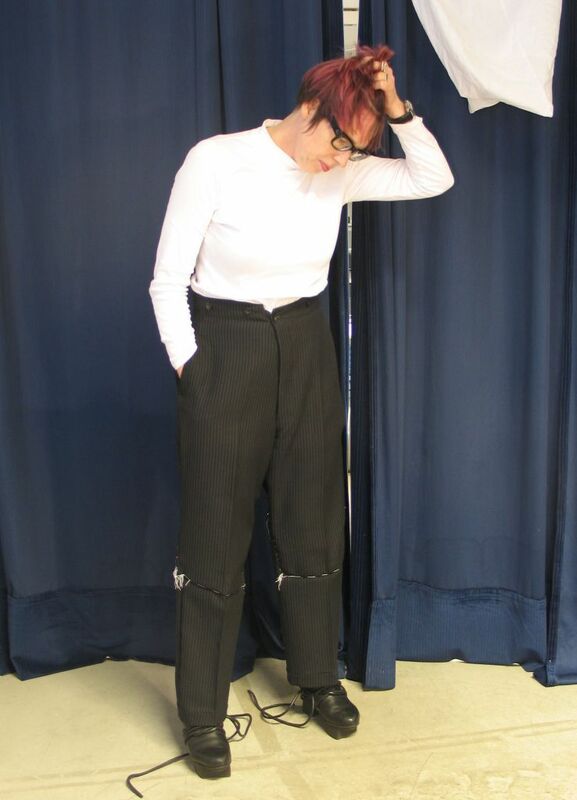 These pants will not break gracefully and they were never meant to, hence the curve in the original cuff. I worked a double-sided tuck into the spiral seam around the leg. This balanced out the bulk and kept everything draping properly. In the end, I have to ask myself: has it all been worth it? Yes. Yes it has. I can’t say I’ve ended up with my ideal pants, but I am pretty darn pleased with the result. I’ve worn them three times already and I’m rather enjoying them. I like the fact that they’re slouchy and structured at the same time, and I’m finding this flood length a guilty pleasure with chunky footwear. As for styling, my favourite look so far is with the oversized white sweatshirt and kawaii sneakers. I was out and about on the day and couldn’t photograph it, but I got quite a few compliments. This is great but limiting, so mostly I’ve been exploring their retro-classic menswear potential in a Katharine Hepburn meets Marlon Brando kind of a way, as I’ve done in these two looks. Any other styling suggestions would be most appreciated. Finally, I need to thank you all for your encouragement in this process. If you hadn’t been there to cheer me on, I don’t think I would have gone the distance. I couldn't resist. I've been shooting for something more minimal lately, but this is too good to pass up. Angie, you got me. Sorry for what I said. I've been clearing the decks for the new season. There are always a few things hiding in the closet, things I love, things that speak to me even when I find them hard to wear. These are two of them. I've never thought of putting them together before but today they make perfect sense. They come from the same place, after all. The blazer is classic Westwood, the one she called Bettina. I'm slightly obsessed with this design and I bought it on deep discount when I was teaching myself tailoring. It's a size too small but I wanted to learn from the best. I ran up a few Westwood copies at the time and I made a creditable imitation of this one. It fits me far better than this, but it lacks that vital sensuality, something about the sharp shoulders and the wasp waist that I couldn't quite pull off. I think I bought scarf around the same time. It isn't my colour and I never know how to tie it, but the print takes my breath away and moves me to tears. Still, it's not my ultimate act of emotional shopping - that would be the skull scarf I bought a few years later when he died. You can't see the thorns in the picture, or the falcons lying in wait for the songbirds. It's so beautiful and so tragic and so very McQueen. I put it all together with gold pants, made by my friend and fellow London girl in Amsterdam, and George Cox creepers, another English classic. It all seems to work but I couldn't tell you why. I probably shouldn't wear salmon pink but it picks out the orange stripe in the plaid. The mauve taupe shirt echoes my new hair, which I'm already struggling to tame, but the cognac shoes don't bookend any more. And gold? No idea how that fits in. Should have gone for more pink in the lip. Sorry for the forum hogging. I’m ill and with time on my hands this weekend and I’m enjoying catching up with you all. I’ve been thinking a lot lately about the relationship between my shopping habits and how it relates to my personal style. This probably sounds like a no-brainer, but in the two years I’ve been a participant on this forum I’ve come to think that the relationship between the two is far more complex than I might have guessed. In her book “I <3 your style” Amanda Brooks says something to the effect that behind every well-dressed woman there are some seriously smart shopping strategies. This observation rang very true to me, and I’ve been examining my own habits ever since. Science has proven that shopping is addictive. This is not news and it’s a hazard that everyone who enjoys clothing will recognise. I’m no more immune than anyone else, and while I adore shopping as part of my lifelong passion for all things sartorial, I need to stay aware of its pitfalls. Viva started a great thread about this a while back, and I posted a rundown of how I deal with it. There are two points here in particular that I think have influenced my shopping behaviour more than anything else, and they are a) raising the bar by dressing well every day, and b) stalking high ticket items. I was completely unsurprised that Viva and Lisap immediately picked up on these as useful tips because they work incredibly well. This is only part of a bigger picture though. I see my clothes as an extension of myself, a form of non-verbal communication with the outside world if you like. But I also have a strong emotional connection with what I wear and the retail transaction is part of that. Furthermore, and I know this sounds like whimsy, I like it when the things I use have a story of their own, and don’t feel like an anonymous industrial product. This is kind of absurd, because most clothing nowadays is exactly that, and there’s not much wrong with that. I just love it when it isn’t. A lot of this comes from a lifetime of shopping vintage and making things for myself. But I realised the other day that so much of what I put on or otherwise keep about me are those kinds of things. More or less everything I reach for, those things that put me in that happy space, are exactly that. This is why I love unique pieces from tiny ateliers and why I can’t resist a bench made shoe for example. But it also leads me to hunt down shops where I can buy from people who share my enthusiasm, with some knowledge about the product they are selling. I’m fortunate to live in a city with a number of retailers like this, but they are few and far between. The funny thing is that with regard to how I look, this is very much a chicken and egg situation. I used to think my shopping habits reflected my personal style, but now I’m starting to think it’s the other way around. Now I’m wondering how I’d look if I eliminated this emotional component and shopped differently. What about you guys? How do your shopping habits influence your look? Would you do it any other way and how would you look if you did? Don’t try this at home. Seriously, don’t. That is, unless you have an unhealthy interest in pants, or your idea of a good time is stabbing yourself repeatedly with pins. I’m at the end of my rope. I’ve come to the conclusion that tailoring is like sausages. Everyone loves it, but nobody really wants to know how it’s made. If you’ve ever made your own sausages, you’ll know exactly what I mean. Nonetheless, you were all perfectly happy to push me into this so now you get to see what’s inside my own personal circle of Hell. I kid. 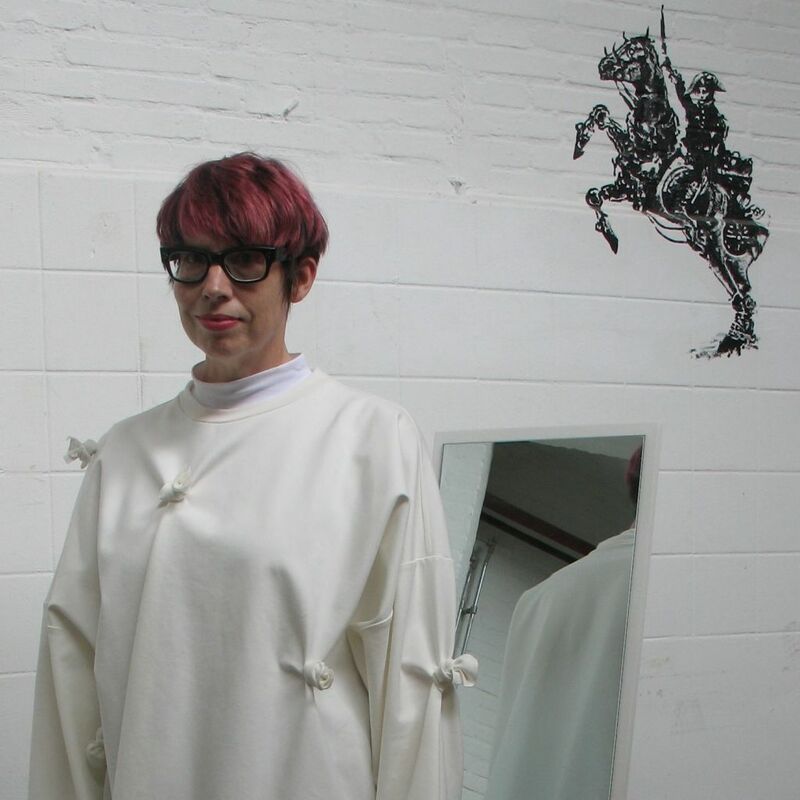 This has been a fascinating project where I’ve pushed my knowledge of pattern cutting to the limits and advanced my tailoring skills. I’m considering adding trouser sculpture and pants origami to the interests section of my dilettante CV. And most importantly, I’m well on the way to some seriously excellent trews. Here’s the thing though. Pants are notoriously difficult to get right. They have to fit, drape and move gracefully, so the only way to work them is on the wearer. 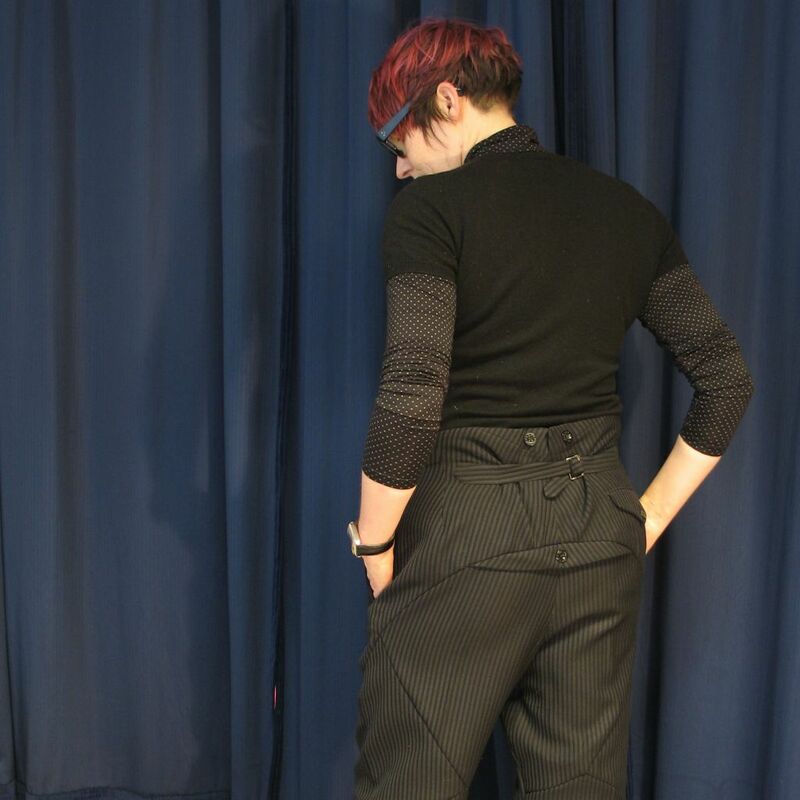 And since the wearer is me and these pants are all about the rear view, that means I have to fit them using two large mirrors and a lot of selfies. You get the idea. It’s all about rapid prototyping and iteration. Modify, test, modify again. The nice thing about working like this is that very occasionally it leads through some blinding complexity to a solution so elegant it feels like it was there all the time waiting to be teased out, leaving you wondering why you didn’t see it before. Not that it would be obvious, far from it, because that kind of simplicity is almost never easy. There’s still work to do here but I feel like I’m in the home straight at last. The end result needs no cuts to the fabric and sticks very closely to the original seams, so in theory they could be restored to their former grandpa pants glory if I ever felt the urge. I know this isn’t a sewing community per se, but for anyone who’s interested, I’ve included a draft of the pattern blocks and approximate alterations, which I’ve been working on so I can see what I’m doing from the inside out, so to speak. Here’s a rundown of the process. 1. My first move was to fit the waistline. 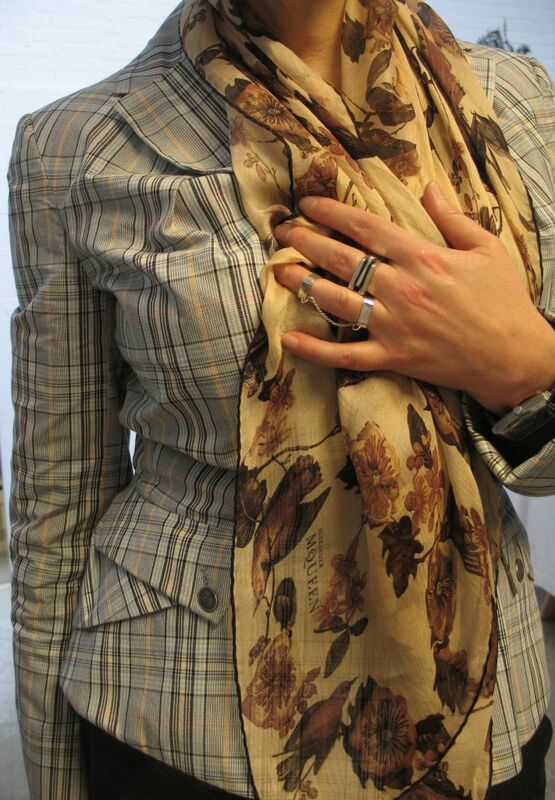 I set a concealed tuck behind the fly to achieve the fit while preserving the drape. This creates a staggered waistband which I actually find more flattering than the original high waist. 2. I then set the back tuck, which had to be balanced with a dart into the front section. This should have been a clue as to how difficult the rest was going to be. 3. I ran into serious trouble trying to tailor the legs themselves. My original plan was to reduce the length with horizontal seams and adjust the profile at the side seams. This draped like cardboard and created yet more bulk which had to be balanced. 4. I then hit on the scheme of twisting the leg around a diagonal seam, which made some kind of sense when I thought about it. It followed the natural drape at the knee and pushed the shape towards a contemporary boot cut. The problem was that it didn’t fit together at all. 5. I fixed this with a tuck from the back of the hip to the inseam above the knee to reverse the twist, and narrowed the leg to the straight grain, eliminating the taper, reducing the dogleg in the side seam and straightening the leg. I quite liked this, the drape was behaving and everything fitted, so I marked it out with tailor tacks thinking I’d do the same on the other leg. 6. In the pictures, the right leg is closer to a straight boot cut. I don’t think these pants were ever meant to be straight though. These are the old fashioned tapered bags your (great)grandfather used to wear and I think I want to keep them that way. Moving on to the left side, I went back to the original side seams and used the tucks alone to correct the twist, which was far harder to achieve on a tapered leg than a straight leg. This produced a larger dogleg in the side seam, a motif I repeated by lapping the side seam in the tuck at the hip. 7. A question on the length: at the moment, one leg is a little longer than the other. The longer delivers PPL, but it breaks ever so slightly. The shorter looks a little awkward but it drapes without breaking and shows off the shaped cuff. It was originally tailored for someone with far larger feet than mine and it looks a little odd even with my chunky shoes, but I’m inclined to shoot for the shorter length to preserve the drape. I need to see how this plays out on the next pass, but what do you think? I had to part company with my prospective business partner. All perfectly amicable, but it wasn’t working out. Some good work came out of the process, and a few new ideas presented themselves, but once again I’m left wondering what to do with my life. A trip to the salon and a little retail therapy didn’t fix anything, but it definitely made me feel better. The change in the season comes as a respite, a welcome relief from the late summer heat. Suddenly the weather is so much cooler and I can break out the winter wardrobe. I’ve sometimes found the transitional season hard to manage but this year I arrived with a plan. I’ve been steadily building a capsule of black and white as core neutrals and I’d been on the hunt for an oversized white sweatshirt for a little while, a team player to style with jeans or a skirt, and of course the fur wrap, which I’ve been reaching for repeatedly lately. This little number appeared at the Amsterdam Fashion Institute shop and I fell for it instantly. Their Individuals collection is a series of small runs designed by the students and it changes very rapidly. I rarely buy anything there but I always make a point of checking them out so I can see what the newest talents are doing. Unfortunately, there’s no way of knowing who designed what. This is a pity, because whoever came up with this masterpiece of ingenious draping surely has a bright future ahead of them. I think it will be a key player this season, if I can resist the temptation to unfasten the knots to see what shape it is underneath. As for the haircut, Angie tactfully asks the other day if I was growing it out, and I was inspired to reevaluate. I’d enjoyed the contrast between the dyed crown and the natural undercut, and I wanted to try something with a bit more body that played better with my specs, which have become a permanent feature in my style. I brought the challenge to my regular hairdresser. I’ve been visiting the same stylist for many years and we have a good relationship. We met for the first time around 2000, when I needed a trim and randomly walked into a salon where he was renting a chair. I walked out with the best cut and colour I’d ever had and he’s been cutting my hair ever since. In the meantime, he’s opened two salons and built a successful practice at the local television studios. He’s an excellent hairdresser, a talented businessman and a great friend. Few of his clients are willing to experiment, so he likes to push the boundaries when I’m in his chair. And I trust him. This week he worked together with one of his juniors, another colour enthusiast, to craft a winter look which evoked the ombre effect of the grown-out roots, tinted to harmonise with the natural ash brown. They agreed on purple and went to work. I’m as delighted as ever with the result, although I may ask for a shorter fringe next time. Oh, and would you believe my sister found me the perfect lipstick? It’s Velvet Rope Brat Pack, a luscious true red by Lipstick Queen. It feels delicious and stays on for hours, but I’m still amazed that she picked out just the right colour. She always gives the best gifts. I have to find something really special for her at Christmas.